14x21 cm, 48 pages, 250 gsm Green Strata card cover, black endpapers, hand sewn with green twist. Colour illustration by Allen Fisher. Click here to read interviews with Lissa Wolsak. Click here to read comments on Lissa Wolsak's work. Click here to read An Heuristic Prolusion. Click here for a biographical note and extracts from A Defence of Being. Lissa Wolsak lives in Vancouver, British Columbia where she works as an energy/thought-field therapist as well as a goldsmith. She is the author of several long poem sequences and essays. SQUEEZED LIGHT: Collected Works is forthcoming from Station Hill Press/Barrytown in September, 2005. 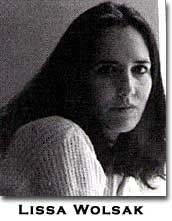 Click here to read Kent Johnson's interview with Lissa Wolsak inVeRT poetry magazine. Click here to read Tom Beckett's interview with Lissa in The Alterran Poetry Assemblage. Click here to read Jen Hofer's review of Pen Chants in Rain Taxi. If I were to argue at this late date of post-culture the view that "poets are born, not made", Lissa Wolsak would be my preferred instance, along with, say, Emily Dickinson or HD - poets through and through, for whom poetry is not so much choice as life-sustaining access to its own intelligible current. Such poets are often outsiders in the sense that their work by its nature is without precedent. That her extraordinary ear for actual speech nuance (however idiolectual) bespeaks the values of a living poetics in the historical context of unconsciously suicidal public discourse; its freshness and always surprising invention of her own revelatory process has no near neighbors. And if she calls a new thinking into play, it is so utterly without dogma and so sensitive to the free movement of mind that its humanness and compassionate nature stand forward. Therein lies her actual politics, alive in the action of what she calls "co-mercy". A hard act to co-opt. 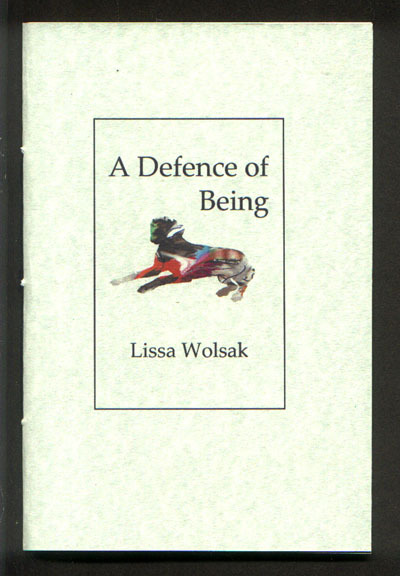 ...............I cannot so much as read a few phrases of Lissa Wolsak's poetry, than I am at it ~~ thinking poetics, writing poetics, declaiming a nature of poetry I hazard to aver that I perceive there. No sooner have I worked what seems the sense of one of her remarkably suggestive phrases, than the event shifts under my cognitive gaze. It did mean thus and so ~~ but having said that, another significance rises into view, another sense of the phrase's en-nested-ness in phrases gone before, another set of significant relations. There is a movement here of a most significant sort, that will not lend itself to precise determination, if only (but not only) because it is each determination that sets the thing in motion. There is a posited constancy, a rumor of a vast and happy sphere in the intuition of which and in the happiness of one's orientation toward which, integration of contingency and optimization towards harmonic opulence might thrive. Some texts or images exude the rumor of it. Some persons in their presence, the character of their attention, the modulations of their energy, also, make it seem ~~ make that which cannot come to appearance, nevertheless come to seem.